See the underwater sights without getting wet from a glass-bottom or semi-submersible vessel! Long rough boat ride. Boat too crowded had to fight for a seat. Schedule very tight. Had to eat right away as helment walker scheduled by operator at 12:50 and lunch was at 12:30. Only had time for a glass bottom boat ride as too many people for the semisubmersible ride. This could have been a five star experience but overcrowded conditions effected the ability to relax and enjoy. Would rather pay more to have less people. A truly magical experience. There was a comprehensive, understandable and humorously presented safety briefing on the way out to the reef. You wear a life-jacket so even if you are not confident in the water it's not a problem. Even a non-swimmer would be fine as long as they are not scarred of water. No matter how much you've seen on TV nothing is as good as seeing it for yourself. Simply float with your head in the water and let the fish come to you, they're pretty curious. Plenty of time to swim around and see everything. There's trips on a glass bottom boat and semi-submersible too. Lunch was good and all the crew really nice. Highly recommended and I hope to do it again some time. 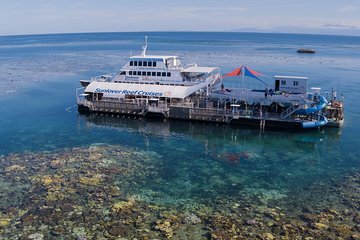 The catamarn ride to the reef turned out to be a nightmare for most aboard it. Practically 99 of the passengers kept throwing up due to the choppy waters. The crew kept running around handing out bags for people to throw up in. By the time we all reached the pontoon, most of the passengers were in bad shape and many were lying down in the seats in the catamaran as they had no energy left to sit up. Some kind of warning should have been given about this possibility by the cruise operators on Viator before we booked . The pontoon was neat and clean and the crew were nice and helpful. However, for people who are not comfortable with snorkeling, diving, or undesea walking, this package offers very less. The semisubmersible ride was really short and the view was the so cloudy that it was like we saw just scratches on the glass and nothing more. The glass bottom boat ride was better as we could at least see the reef through the viewing glass. The touch tank was a waste as all they showed were 3 sea cucumbers and a shell or two. We can't comment on the diving and other activities, but for the non-diver, this trip was a dud. Loved this tour and going to the Reef, it was the highlight of my trip. The staff were really great with setting us up with our gear and really enjoyed when one of them snorkeled with us and showed us Nemo and the Sea Turtle and gave us information on the area and fish that were there and about saving the ocean. We lucked out on the weather as it had rained for the previous 3 days. I can now say that I snorkeled on the Great Barrier Reef, but that is all. If you have snorkeled anywhere in the Caribbean or Hawaii, it is the same fish swimming in the same kind of coral. It is a great experience for people who have never seen a reef before, but not really for someone who has experience snorkeling. The lunch buffet was great and there was plenty of food. une équipe accueillante et très professionnelle pour toutes les activités. Le buffet du midi est très bon. Going to the Great Barrier Reef was a highlight of out Australian trip. The boat that took us to the reef was conveniently located from the peer where out cruise ship as docked, about a fifteen minute walk. 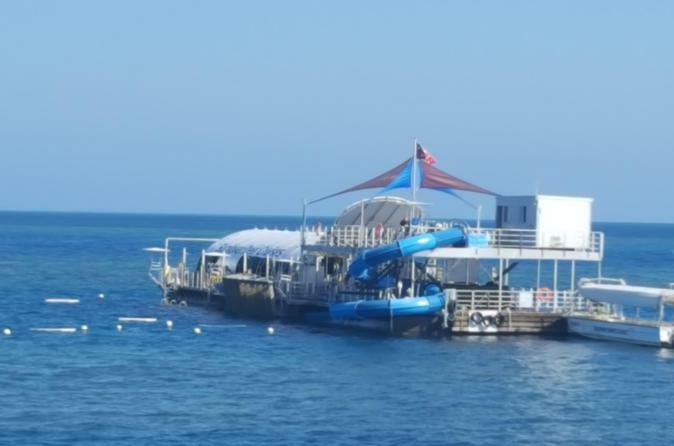 The staff was very helpful, and my wife really enjoyed being abler to snorkel with no time constraint. I gag so made use of the glass bottom boat and semi-sub to view the wonderment and beauty of the reef. The lunch was excellent as well. An experience that we will never forget. It was well worth our time and money. We enjoyed it very much. There was so much beauty to be seen.